The first ever plant that I grew myself, as a 7 year old, was a Caladium. Digging small tubers, given by my father, in a container, watering it daily and watching it twice a day sprouting and sending off colorful leaves was like a magic. I just fell in love with colorful heart-shaped leaves of all shades of green, red, white, silver and pink. They looked like color pallets of an artist. We still grow Caladiums in our house and enjoy the spectacular show of colorful foliage every year with the same delight and amazement. Caladium is a genus of about 15 species and thousands of cultivars that are grown in many temperate regions as ornamental foliage plants. Usually grown as perennials, they are good as ornamental pot plants, as colorful foliage plants for window gardens, or as ground covers under shady trees. Flowers are inconspicuous but the plant itself is quite attractive. Caladium is also known as Elephant Ears, Angel Wings or Heart of Jesus. Caladiums can be grown easily from divisions. The tubers multiply easily and can be stored in winter for sowing later in spring. Caladiums are native to Florida, South America and parts of Central America where they grow in humid and temperate climate. That is why, you need to imitate the same climate for Caladiums when growing them in outdoor in gardens or indoor as patio plants. 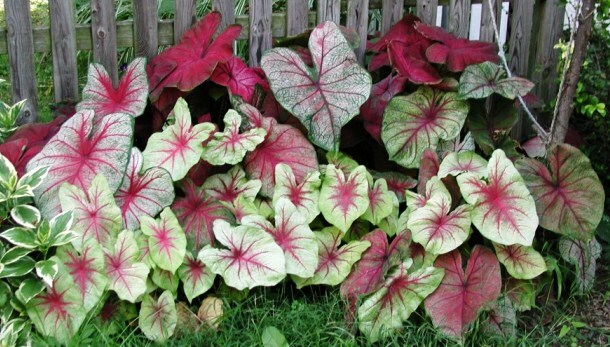 Caladium requires regular water and partial shade (but well-lit) spots to flourish. They also require rich soil so fertilize them during the growing season. Caladiums do very well in tropical areas.Although I live in Zone 10 where temperature ranges between0C-45C the tubers won’t multiply.Infact, with the passage of time they’ll eventually disappear.It might not be a bad idea to store tubers indoors in winter.